Find curated resources on diversity, equity, and inclusion. 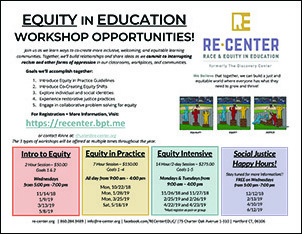 RE-Center is offering Equity in Education Workshops in November 2018 through May 2019. The workshops are designed to help educators and others understand the different ways racism and other forms of oppression show up in classrooms and workplaces and how to interrupt these forms of oppression through Equity Shifts, Restorative Justice Practices, and problem solving for equity. The workshops have three different formats and are offered at various times over the next 8 months. The workshops are geared towards educators, community influencers, and folks in the nonprofit and social justice world—and are always open to anyone interested in the personal and professional process of equity and anti-racism. In 2016, Washington Regional Association of Grantmakers (WRAG) launched Putting Racism on the Table, a learning series for philanthropy. The series, from January - June 2016, convened philanthropic CEOs and trustees to learn from experts on the many aspects of racism, including structural racism, white privilege, implicit bias, mass incarceration, and the racial mosaic of this country. Resources from the series are available on the WRAG website. 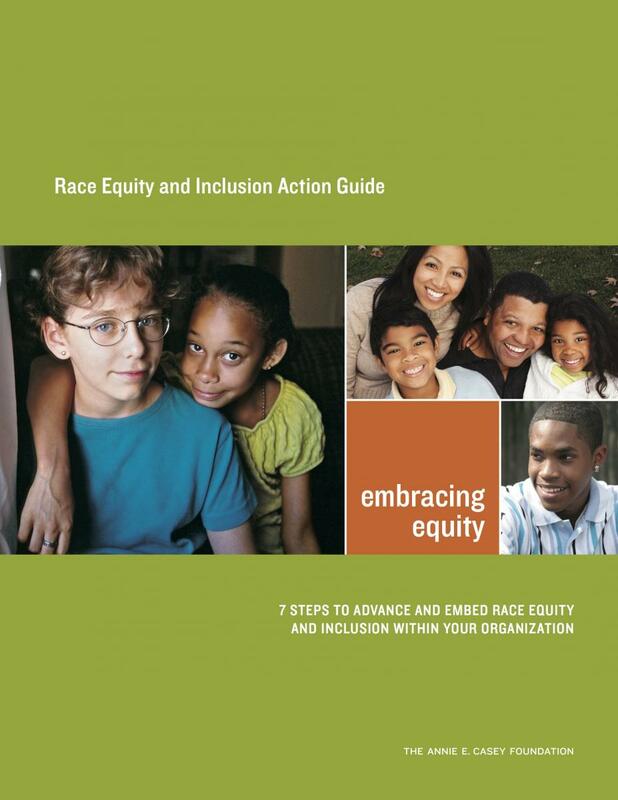 The Philanthropic Initiative for Racial Equity provides publications, resources, and programming that can aid as you look to advance racial equity through your foundation. The goal of the initiative is to "increase the amount and effectiveness of resources aimed at combating institutional and structural racism in communities through capacity building, education, and convening of grantmakers and grantseekers." How do nonprofits see diversity as relevant to their goals? How do they want their foundation funders to be involved in their diversity efforts? In discussions about diversity at foundations, it’s essential that the perspectives of grantees be included in the conversation. 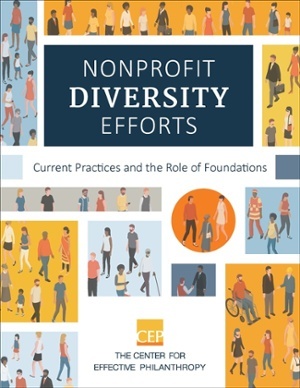 Center for Effective Philanthropy (CEP) turned to its Grantee Voice Panel of nonprofit leaders to learn more about how nonprofits are thinking about diversity — and how foundations can be most helpful to their grantees, if at all, when it comes to this topic. 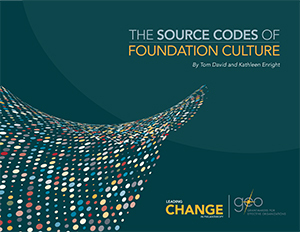 Based on survey responses of 205 leaders of nonprofit organizations with annual expenses between $100,000 and $100 million, Nonprofit Diversity Efforts: Current Practices and the Role of Foundations provides a collection of data on topics such as how diversity relates to the work of nonprofits and what demographic information nonprofits and funders alike are collecting — and how that information is used. The data in this report can inform foundation leaders and staff as they consider how they can most helpfully engage with their grantees on the topic of diversity. Grantmakers for Effective Organizations' publication begins an exploration into the set of influences shaped by grantmakers’ founders and leaders that affect organizations’ internal cultures. Funders can use this document to support conversations among board and staff to articulate and understand the origins of organizational assumptions, examine beliefs and behaviors, and identify aspects of culture that drive or impede effective work. The Graustein Memorial Fund found this publication very helpful as they started to examine their internal culture and consider how they wanted to address equity issues. Kathleen Enright, President and CEO of Grantmakers for Effective Organizations explains why having conversations around racial equity is critical and will require us to be vulnerable if philanthropy is to succeed in addressing race and making positive changes in their communities. One way to achieve social change in an organization is to incorporate race equity and inclusion at every stage of work. The seven steps in this guide, from the Annie E. Casey Foundation, provide a clear framework for undertaking this important work. This tool adds to the resources already created by partners who have been working in the field. This report from Putnam-Consulting Group and Robert Wood Johnson Foundation provides a look at some of the efforts leading foundations are making, as well as the challenges they face. 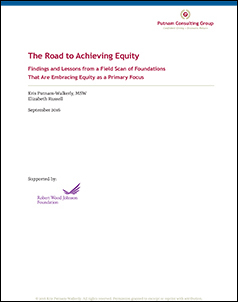 Based on interviews with 30 foundation leaders, this report explores the ways in which foundations are applying principles of equity within their own operations - from grantmaking, to investments, to human resources. D5 is a five-year coalition to advance philanthropy’s diversity, equity, and inclusion. D5 builds on the achievements and lessons of many in the field. The decades-long work of affinity groups and other partners on diversity issues are essential building blocks of D5′s work going forward. D5’s ultimate goal: By bringing new voices and expertise to the table, we have the potential to make foundations more effective at advancing the common good. Diversity and inclusion can help foundations better identify creative solutions to our internal challenges and to those faced by the communities we serve. 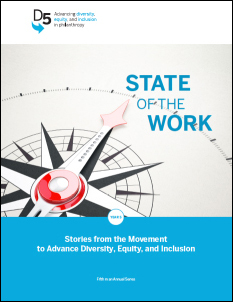 D5’s Final State of the Work highlights voices of leaders in the field who share their stories of change and progress. Some are longtime advocates; some are newer enthusiasts. Each of them shares a perspective on what has worked and what challenges remain as they lead their institutions through changes to meet the demands of a new America. 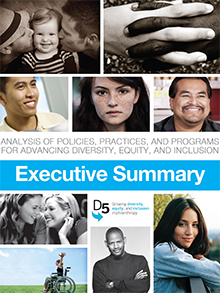 D5's Analysis of Policies, Practices, and Programs for Advancing Diversity, Equity, and Inclusion is a useful tool for foundation staff, leadership and other members of the philanthropy community who want to take action to advance DEI. It provides a comprehensive scan of existing written and web-based resources from philanthropy and the more general fields of organizational effectiveness and social justice in order to identify existing policies, practices, and tools that can inform and guide philanthropic action.